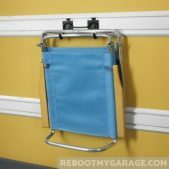 I spent hours and hours going over garage wall storage systems. I recorded pros and cons. I calculated upfront costs and lifetime costs. I read reviews. I called wall system manufacturers. 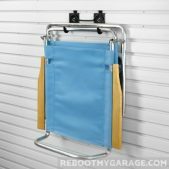 This is what I found about Gladiator GarageWorks garage wall storage. 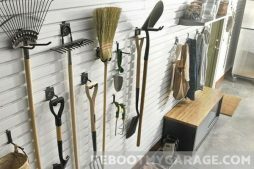 What is the best garage wall slatwall storage system? 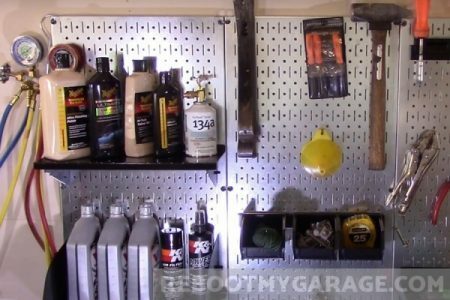 Gladiator GarageWorks is the best garage slatwall organization system. 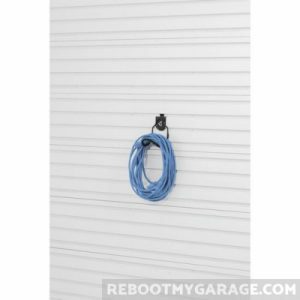 GarageWorks is a reasonably priced system that’s easy to install, has durable good looks, is strong, flexible and has a great reputation. accommodate sporting goods, bikes, garden tools, hoses, cords, auto supplies, hand tools, power tools, and similar weights and shapes. Gladiator passes on all requirements except shelving. Gladiator does sell shelves, but not for their wall storage systems. Everything else is here. Gladiator is easy to install. It carries loads up to 75 lb. It looks good. It offers tons of hooks. You can easily move things around. Use baskets or bins. Gladiator offers first class cabinets. Gladiator has tons of good reviews online. 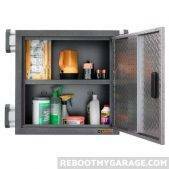 You can use it to store sporting equipment, garden tools, hoses and tools. You can use GearWall panels where you want to cover a good part of the wall. 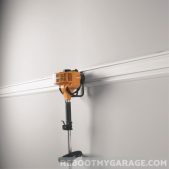 Use GearTracks where you want to put up a foot or two of 4 ft. wide storage. The biggest complaint is shipping damage. I spoke to Gladiator for almost an hour. The support rep emphasized that Gladiator is happy to replace shipping damaged parts. But customers have to ask! These are long products with edges; they weren’t made for UPS trucks. Stuff happens, but Gladiator is anxious to make it right. They want customers to be happy. The other consistent complaint is about the Gladiator mounting hardware. People really prefer using deck screws instead, so I’ve listed the options below as well. The good: GearTrack and GearWall are sturdy, clean and easily cut to size. The bad: The hardware and end caps do not come standard with the tracks and panels. The mounting hardware is not that well-liked; Shipping damage issues are common. The surprise: I spoke to Gladiator support for almost an hour about how their system works. He asked me to let people know about their shipping damage policy. Gladiator will send out replacements for damaged items. But you need to ask! He said it’s frustrating to see bad reviews. Gladiator authorizes its support team to send out free replacements. I recommend Gladiator for its quality, storage choices, and reputation. Gladiator will send out replacements for damaged items. But you need to ask! 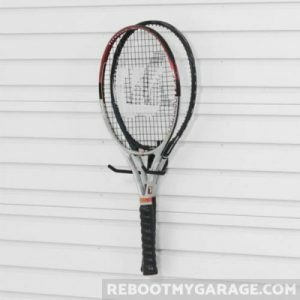 GearTrack or GearWall: What’s the Difference? Decide up front if you want a contiguous wall of storage, independent channels called “tracks,” or both. GearWall is the wall of storage. GearTrack is the individual tracks. 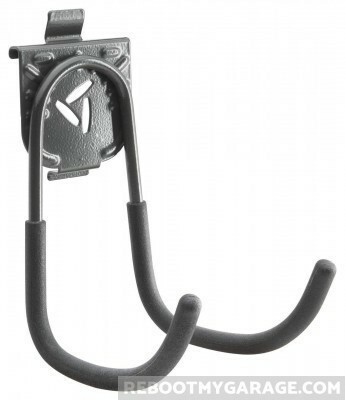 Gladiator baskets and hooks work with both the GearWall and the GearTrack. 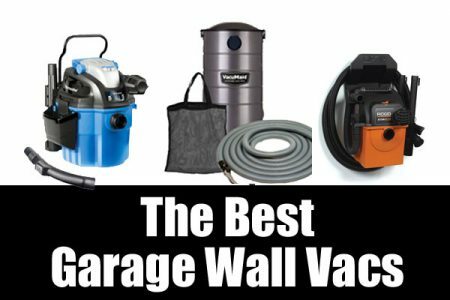 But the GearWall is a large wall that covers your existing garage wall. And the GearTrack is an independent channel of storage space. 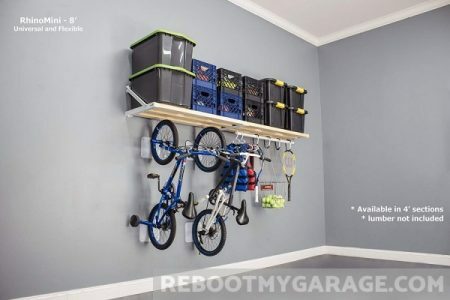 The GearWall is a contiguous wall storage solution. There are no gaps between the sections. The panels cover the wall. GearWall panels come in 8 ft. and 4 ft. widths. The panels interlock together to create one contiguous wall of hanging channels. GearWall panels cover everything behind them, including outlets and electrical outlets. So your GearWall solution might include cutting the panels to expose these again. Each GearTrack is independent of the other GearTracks. 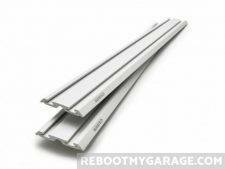 GearTracks come in 4 ft. widths. They create independent hanging channels. GearTracks don’t interlock with anything: not each other, and not with GearWall panels. You can stack GearTracks, but they won’t interlock. To help you understand the differences, let’s create 16 sf. of storage using each of the Gladiator panels and tracks. Each 8 ft. GearWall package contains a set of two 8 ft. GearWall panels. Get one package. You will receive two 8 ft. wide by 1 ft. high panels. Stack the two panels to create an 8 ft. wide by 2 ft. high contiguous wall offering 16 sf. of hanging space. Or place them side-by-side to create a 16 ft. wide by 1 ft. high storage wall. 2 8 ft. panels create an 8 ft. wide by 2 ft. high wall. A package of two 4 ft. x 1 ft. GearWall panels. 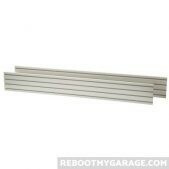 Each 4 ft. GearWall package contains a set of two 4 ft. GearWall panels. Get two packages. You will receive four 4 ft. wide by 1 ft. high panels. 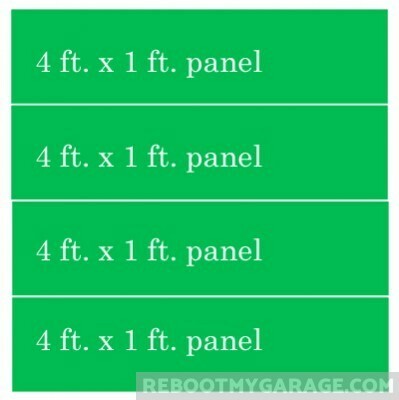 Stack the four panels to create a 4 ft. wide by 4 ft. high contiguous wall offering 16 sf. of hanging space. Or, stack two panels next to two more panels to create an 8 ft. wide by 2 ft. high wall. Or, place all panels horizontally to create a 16 ft. wide by 1 ft. high wall. Four 4ft. panels create a 4 ft. wide by 4 ft. high wall. 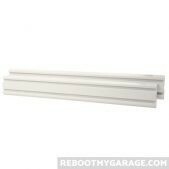 Each 4 ft. GearTrack package contains two 4 ft. wide by 6 in. high channel. The channels (tracks) do not lock together. You can stack them and place them next to each other, but they don’t interlock. 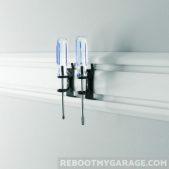 This is especially useful if you don’t want to cut the wall panels to expose light switches and electrical outlets. Each package contains 8 ft. x 6 in. of track, or, alternatively, 4 ft. x 1 ft. of track. It just depends on how you view the two tracks. Each 4 ft. x 6 in. of track is 2 sf. of storage. Each package is a set of two tracks equaling 4 sf. of storage. 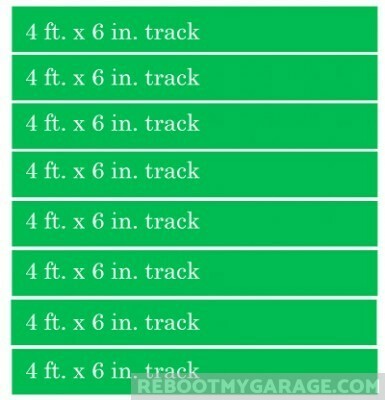 Buy four sets of GearTrack to create 16 sf. 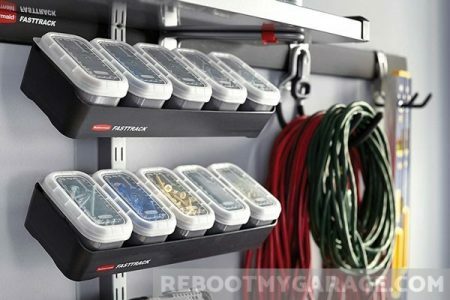 of GearTrack storage. Eight 4 ft. x 6 in. GearTrack channels creates 16 sf. of storage. GearWall panels have a reputation for arriving having slightly different widths. You can cut the outliers down to size, but you’re still left with exposed edges. Also, you need to cut GearWall panels to expose the electrical outlets and switches underneath. You will want to cover the cut edges with trim. Similarly, the GearTrack ends come exposed, and you will want to cover these. 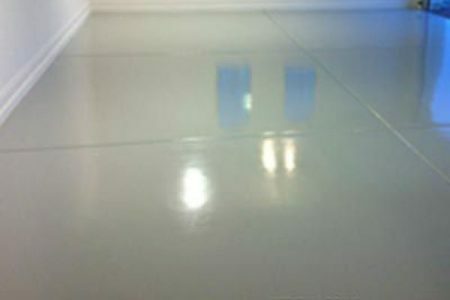 Covering the ends and cuts allow you to create a professional installation. De-cluttering is about feeling better about your environment. 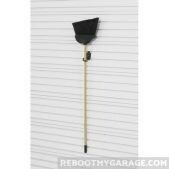 Covering the edges is going to make the difference between a sloppy and a professional looking garage. Cover GearWall panel ends and cuts with panel trim. The trim comes in packs of six 8-foot lengths. White matches the panels and gray complements them. Cut the trim to size and snap over the exposed edges. Cover GearTrack ends with end caps. End caps snap over the GearTrack edges, giving the tracks a professional finish. Warning: GearWall 8 ft. wide panels are difficult for just one person to install. Get 4 ft. panels or tracks if you think the 8 ft. panels might be to unwieldy to hold level while installing. Warning: GearWall panels are designed to cover entire areas without gaps. You will need to cut the soft plastic and apply panel trim to the newly-exposed edges. 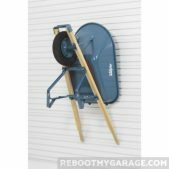 Get the GearTracks instead of the GearWall panels if you’re not comfortable cutting the plastic and and trim. 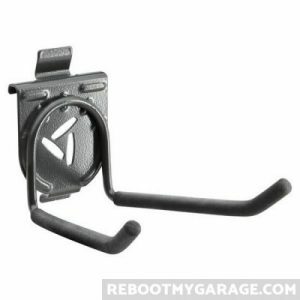 How are GearWall and GearTrack Installed? 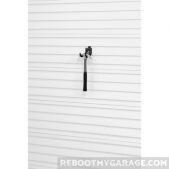 GearWall panels and GearTracks install horizontally on the garage wall. You must install the tracks into wall studs. Install through drywall and into the studs, or just directly into the studs. For masonry installations, attach furring strips to the masonry, and install the channels into the furring strips. The weakest link in the Gladiator wall system chain is its hardware. You might want to swap out the screws. I go into great detail on this below. You also need to decide if you’re getting GearWall panels or GearTracks. See GearWall or GearTrack: What’s the Difference, above. Measure the installation area. You can cut the panels if you have to, but it’s better to size the solution to the wall. Each GearWall 8 ft. package contains two 8 ft. wide x 1 ft. high panels. Each GearWall 4 ft. package contains two 4 ft. wide by 1 ft. high panels. Each GearTrack 4 ft. package contains two 4 ft. wide by 6 in. high tracks. I’ve studied many slat wall instruction manuals. 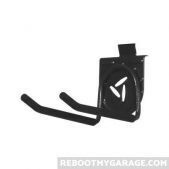 Gladiator GarageWorks installation is typical. You will need to find the studs. You will build from the bottom up. You will pre-drill holes. You will fasten middle studs first. You will fasten the outside studs last. Then you will add edge trim. Each GearTrack can hold 75 lb. per linear foot (or 300 lb. per 4 linear ft.). GearWalls hold 50 lb. per sf. One 4 ft. x 1 ft. panel is 4 sf. which holds 200 lb. One 8 ft. x 1 ft. panel is 8 sf. which holds 400 lb. Hooks hold from 5 lb. to 50 lb. The Golf Caddy holds 75 LB. Doubling up hooks also doubles load capacity. Gladiator garage wall tracks and panels are attractive. They give the wall a sharp, finished look. I’ve read tons of internet Gladiator reviews. Gladiator always gets good marks on looks. Gladiator hooks and accessories lock onto the channels. You don’t need tools to move the accessories around. Just unlock, move the hook, and lock again. It’s kind of a brilliantly simple storage system. 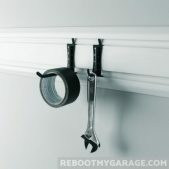 After installation, you can hang all manner of tools without pulling out your stud finder and drill. Holy cow, documenting the Gladiator hook inventory got pretty tedious after a while. They have 17 different hook designs, 2 baskets, and 3 caddies. View the many Gladiator hooks starting here in this article. 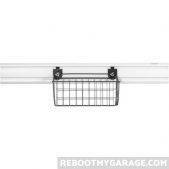 The Nylon Mesh Basket is 2 ft. wide. The Gladiator 24″ Wide Mesh Basket is perfect for storing stuff that doesn’t have a built-in hook. The basket is 2 ft. wide and over a foot deep. Use the basket to store beach toys, sporting balls, baseball mitts, tennis rackets, and sleeping bags. 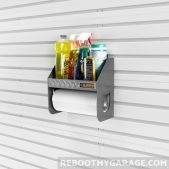 The Storage Bin Holder is two rectangle arms that sit at a 45 degree angle. You can place an 18 gallon storage bin into the arms. Put the arms closer together for smaller bins. 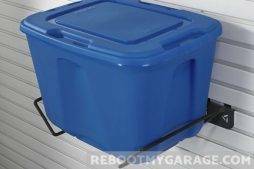 The Storage Bin Holder can carry up to 25 lbs. I’m not a huge fan of wire baskets. Stuff can fall through wires. I prefer bins. But they’re OK for holding cleanings supplies and sports balls. The 18″ Wide Wire Basket is 11″ high and 13″ deep. I still like a wire basket more than an open-ended shelf, though. This basket is good for a couple of sports balls, a sleeping bag, and cleaning supplies. 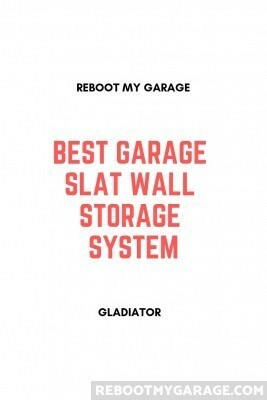 Reviews of Gladiator garage cabinets are almost completely positive. 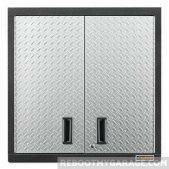 Gladiator offers pre-assembled and assembly-required (Ready to Assemble) cabinets. I don’t want to spend my Saturday assembling cabinets. Pre-assembled cabinets cost more. They’re worth it, to me. 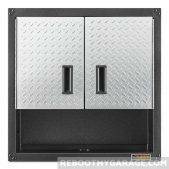 Gladiator offers three cabinets with the GearWall/GearTrack system. They’re called GearBox. They come in 24″, 28″ and 30″ widths. The 24″ and 30″ are Pre-Assembled cabinets. The 28″ cabinet is Ready to Assemble. Gladiator doesn’t sell GearWall/GearTrack shelves. 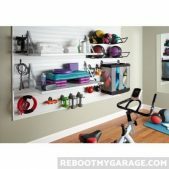 They do offer shelves, just not for the GearTrack/GearWall system. They look sturdy and easy to put together. Use #8 1-1/4″ and 2″ self-tapping stainless steel screws to install GearTrack or GearWall on bare wood studs. Use 3/16″ x 1-3/4″ Tapcon concrete screws to install GearTrack or Gear Wall on masonry. GEARTRACK CHANNEL (2) GAWC042PZY I 48″ 12″ (TWO 6″) 100 LB. LF. 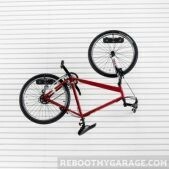 Use the Advanced Bike Storage v3.0 hook to vertically hang bicycles. They hold up to 50 lb. 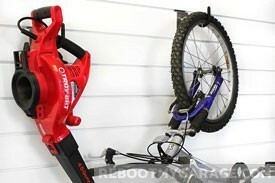 Use the Horizontal Bike Hook to store a bike horizontally. They come in pairs. The pair of Horizontal Bike Hooks combined 50 lb. DUAL HOOK GAWUXXWHRH 10.75″ 5.75″ 2.75″ 50 LB. BIG HOOK GAWEXXBHSH 4″ 7.5″ 7″ 50 LB. UTILITY HOOK GAWEXXUHSH 3.75″ 5.75″ 4.5″ 50 LB. The Wide Hook, Twin Hook and Scoop Hook are uniformly shaped double-hooks. The Tool Hook has two small hooks at the bottom and two larger ones at the top. The S Hook is a single bent hook. The Cradle Hook holds 25 lb. so be sure to measure your hose weights before using it. 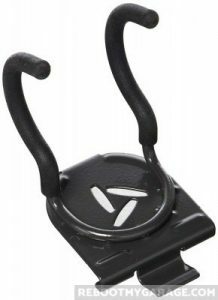 CRADLE HOOK GAWEXXCLSH 4.5″ 7.5″ 6.5″ 25 LB. The Cradle Hook holds up to 25 lb. 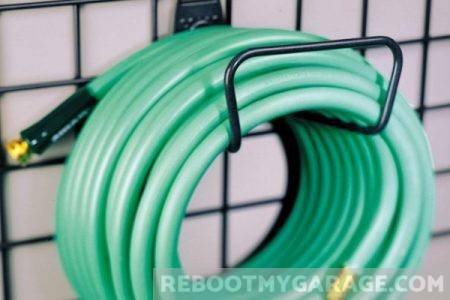 of cord or hose. The J&L Hook is actually two different hooks. One is a “J” and one is an “L.” The J&L Hooks and the Loop Hook each holds 5 lb. J&L HOOK (8) GAWAJL8PPH 1″ 4″ 5 LB. LOOP HOOK GAWALP8PPH 1″ 4″ 2″ 5 LB. The Storage Bin Hooks hold up to 50 lb. in a bin you supply. Coolers hang well from these holders as well. 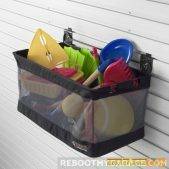 STORAGE BIN HOLDER GAWUXXBMTH 24″ 24″ 12″ 50 LB. 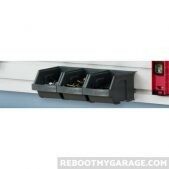 Get the Storage Bin Holder to mount storage bins on the wall. Holds up to 50 lb. 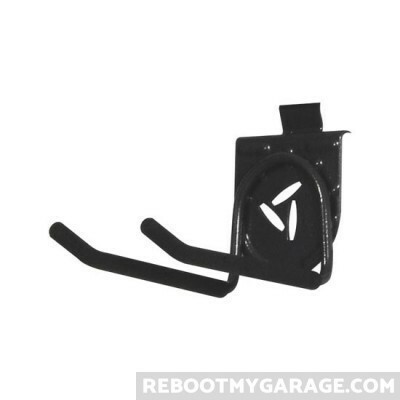 The Storage Bin Holder is two rectangle arms that sit at a 45 degree angle. You can place an 18 gallon storage bin into the arms. Put the arms closer together for smaller bins. 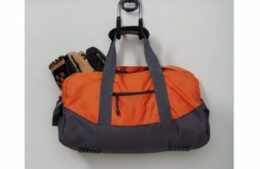 Hanging Sports Equipment up to 35 LB. 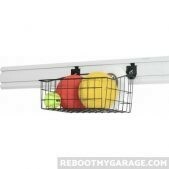 The Mesh Basket and the Ball Caddy are each 2 ft. wide, which I think is a really generous size for a wall hanging system. The Mesh Basket and Wire Basket hold up to 35 lb. The Ball Caddy holds up to 25 lb. 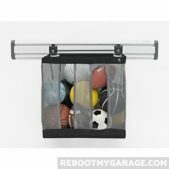 The Ball Caddy is really good for sports balls, but can be used for other equipment as well. 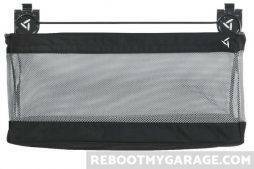 24″ MESH BASKET GAWU24MBBH 24″ 14.5″ 12.5″ 35 LB. 18″ WIRE BASKET GAWA18BKRH 18″ 11″ 13″ 35 LB. BALL CADDY GAWUXXBLTH 24″ 24″ 12″ 25 LB. Get the Gladiator 24 in Ball Basket. It holds 10 large balls and is accessible from the side as well as the top. The Small Item Bins comes 3 to pack. Each bin is 4.5″ wide and 7″ deep. My nuts and bolts would have to be pretty dense to overload their 10 lb. capacity. SMALL ITEM BIN (3) GAWESB3PGC 4.5″ 4″ 7″ 10 LB. The Cleanup Caddy holds a hefty 25 lb. and a roll of paper towels hangs underneath. 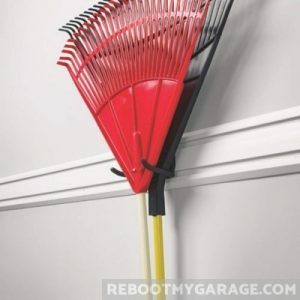 What do people think of the Proslat garage wall storage system? 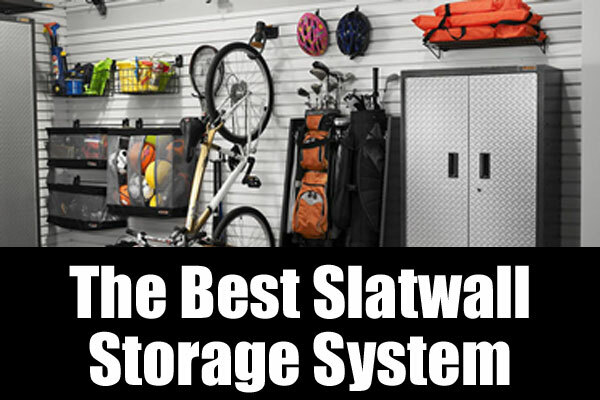 Gladiator’s best competitor is probably the Proslat garage wall storage system. Learn more about Proslat here. 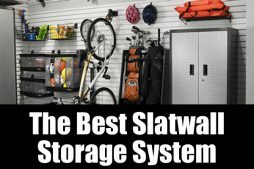 Can I store bicycles on slatwall? 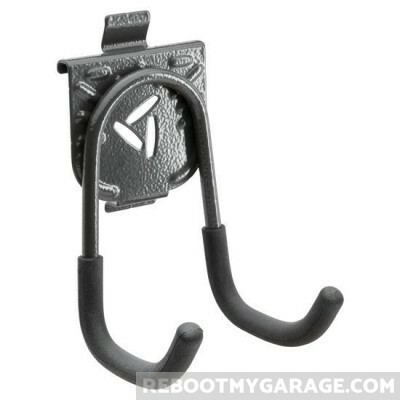 Yes, all major slatwall vendors sell bike hooks. 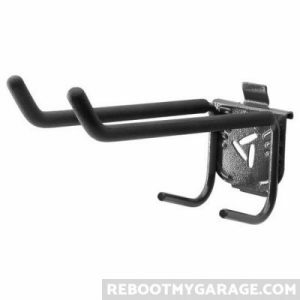 Gladiator offers the Advanced Storage Bike Hook which locks onto the wall and grabs onto the bike tire; and the Horizontal Bike Hook for hanging the bike profile against the wall. 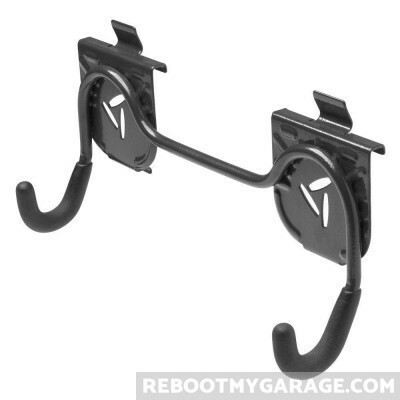 Proslat offers the Super Duty Bike Hooks (2 per pack), also for hanging the bike flat against the wall. Can I use Proslat gear on Gladiator? In general, one vendor’s hooks won’t fit on another vendor’s wall system. Sometimes you will get a fit, but it’s best to stick the hanging tools made by the brand who made your slat wall or slat track.